WHAT'S UP THE PIKE: East Silver Spring resident (and occasional guest blogger) Elisabeth Null singing in concert Feb. 28; Nancy Navarro running for Marilyn's seat in special election April 15; Maryland Politics Watch examines the District 4 council race. 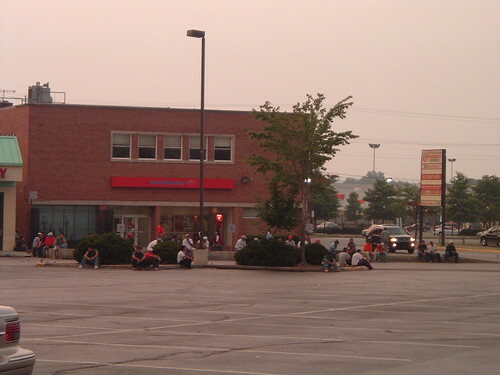 Day laborers wait outside a shopping center in Langley Park at sunrise. Molin, who moved to Maryland from Mexico, also said he likes that there are so many Latinos in the neighborhood. He drives to Baltimore for work, but wouldn't consider moving there, "because this neighborhood is more familiar," he said in Spanish. "It seems perfect to me how it is." Maria Veator started renting an apartment in Langley Park eight years ago, moving from neighboring Adelphi. "Here, you can do more if you don't have a car, and the rent was lower," she said in Spanish. "Now, it's high -- $1,100." She called Langley Park the place where poorer people live -- and it makes her feel at home. Urban planners often preach the virtues of mixed-income communities as places where people learn to get along with those of different backgrounds. It's one of the reasons why Montgomery County established its Moderately Priced Dwelling Unit (MPDU) program over thirty years ago, though in recent years it's faltered because many developers have opted to put money in a so-called "housing fund" rather than include affordable housing in their projects. It's unsettling, then, to read that people want to live in neighborhoods with others like them, whether they reside in a McMansion in Chevy Chase or a walk-up in Langley Park. For immigrants new to the country, having a built-in community of people from home could ease the transition to American life. And there can be tension between rich and poor in some mixed-income communities, whether it's getting the cold shoulder in Gaithersburg's Kentlands (a model for this kind of development) or the stabbing of a local punk icon last summer in Briggs Chaney, where half-million-dollar townhouses are going up next to subsidized apartments. To me, it's just a stronger argument for more integrated communities. An immigrant family in Langley Park may work their way up the income ladder and look to live in a wealthier neighborhood. When they leave, it destabilizes the community - and it's one less example of success for newcomers to see and strive for. Making Langley Park a home for more than just the poorer people may take an act of God, but it's worth creating less transient neighborhoods. That, to me, would be perfect. I'm confused - it's "unsettling" when people only want to live in neighborhoods with others like them, but they should stay even if they can afford to move to a nicer neighborhood so that they don't destabilize the community? Ah, Langley Park. This used to be a great place as a kid... the Toys R Us, Foot Locker Outlet (still there! ), the movie theater in the shopping center at NH & University and birthday parties at the Shakey's Pizza. Now it's a traffic hell to be avoided at all costs, with exceptions for the Udupi Palace lunch buffet, of course. Call it gentrification from the inside out, if you will. If people make more money but stay, the demographics of the community will change, thereby attracting higher-end amenities. Obviously, there have to be strong reasons for them to remain other than civic pride and Udupi Palace. Improving the schools, for instance, but it's easier said than done. But consider the alternatives, which are a) continuing the cycle of transient residents or b) waiting until Langley Park gets "hot" and the luxury condos go up. The first option wouldn't really change Langley Park's image, but it wouldn't improve it, either. The second could destroy why we like the neighborhood. You could also call it self-imposed racial segregation... if Latinos make enough to move to wealthier, non-predominantly Hispanic neighborhoods, you seem to be saying that they should still choose to stay in Langley Park. One reason cited for the decline in Black inner-city neighborhoods over the years is residents leaving for greener pastures. When middle-class blacks were no longer prevented from moving into nicer "white" areas, they chose to move out of their segregated neighborhoods. Then, only the poorer and less educated residents remained and the quality of life declined. I guess the alternative was to remain segregated by choice for the "good of the community". The fact is that when people can afford to they will usually move to a better neighborhood and a bigger house and better schools for their kids... that's the American Dream which I imagine most immigrants come here to pursue. Yes, the quality of life does decline when people can afford to leave a place and do. Not saying they shouldn't be allowed to do so, but giving them a reason to stay should be a priority. How many blacks living in the suburbs still commute to their old neighborhoods in D.C. for church? Would people move back if it was a nice place to live again? Slate mentioned a study released earlier this year that said poor blacks were more likely to engage in "conspicuous consumption" (buying expensive cars, TVs, clothes, etc.) than poor whites. 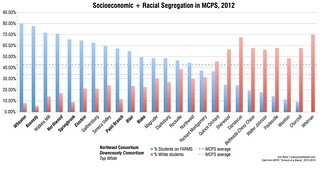 That's because, the study said, black neighborhoods tend to be more economically homogeneous than white ones. If you're poor and white, it says, you're probably around people better off than you, meaning that you won't gain status simply by buying expensive things. That doesn't work when everyone around you is poor and so-called "status symbols" gain a whole new prominence. So there's an issue of perspective when you live in a community where everyone else is like you. This is why mixed-income communities are important. Langley Park is already ethnically diverse - we need to make it socioeconomically diverse as well. If people want to stay, they'll stay... it's a free country. As far as MPDU's go, even if a building does have them the rent is still $1000/month+ for a 1BR, which, according to Ms. Veator, is "high". Up the road from Langley Park-on Riggs Rd- you will find the Green Meadows shopping center- nothing to write home about- but the homes behind the shopping center are quite nice- they may be part of the section of Lewisdale. Langley Park has had a diverse history- it was once a predominant Jewish neighborhood, then it became a predominant black neighborhood- then it fell into a funk in which it became a very popular drug neighborhood. Now it is mostly hispanics. If you are going to write about the past- do not forget the Might Mo restaurant, Weiles Ice Cream Parlor, the movie theatres, the Hot Shoppes, the Giant,Korvettes, Little Caesars Pizza, Louigis(which gave Ledos a run for the best pizza)and for those really old timers,a minature amusement park(roller coaster, ferris wheel and some other rides) off of New Hampshire. There are some solid neighborhoods in and around Langley Park, especially between Riggs and Adelphi roads, and on New Hampshire towards Hillandale. Even on New Hampshire, you can see how a lot of the formerly-small ranch houses that make up the area are being added on to. That's exactly what I'm talking about - families putting down roots in the area. And it's what's going to save Langley Park in the long run. Funny, I was just thinking how some of those small ranch houses were being turned into monstrosities far too big for the neighborhood they're in. There's one on University that looks like might tip over, it's so top heavy. Did they really get building permits for these? Do u mean [when driving twards LP from Piney Branch Rd] the white mcmansion just before the adventist Medical bldg? It def looks top heavy to me. & there is no fron yard! Doesnt MoCo have a rule requring a front yard? At the start of Feb Kensington passed a law banning cars from beng parked on front yards/lawns. I think that may be the one, but I wouldn't go so far as to give it credit as being a proper McMansion. Once the Purple Line is built rents will go up astronomically and force small business out as Montgomery and PG seek to "maximize" land use with new highrise apartment towers. Right now what they have is a vibrant community with some crime and other community issues that can be dealt with. By introducing the Purple Line we will destroy the fabric of the community and just create another cookie cutter town center. Lets kill the Purple Line before it kills our community! RE: To be Very Honest with you Langley Park is already close to hitting rock bottom when it comes to being unique and attractive to Outsiders and Business Growth. The Entire Shopping Center is filled with Litter, Drunks hanging out in the parking lots, Cheap clothing stores and poor tasting Central American Eateries, Bumpy Roads, a Gang of Mexicans running in front of cars driving on University Boulevard and New Hampshire Avenue, and MS-13 Graffiti on Properties. RE: You didn't have to waste the typing space to prove that the Purple Line is a Waste of Taxpayer Money. BTW- The Purple is not any indication that it will force Redevelopment in Langley Park because if that were true than why aren't there much Development Activity along the Subway Stations along the Orange, Blue, and Green Lines in PG County. If and when the purple line is built, it will change the character of the commericial areas along the purple line because it will give the people who live in the east county easy access to commercial areas in the central and western county. 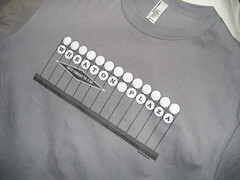 In case you don't remember, Wheaton was actually a nice, clean, safe middle class area before the Wheaton metro was built. The opening of the Wheaton metro gave the underclass along the lower redline easy access to Wheaton Plaza (now Westfield Wheaton). It didn't take long for the middle class to move north Olney and Brookeville.